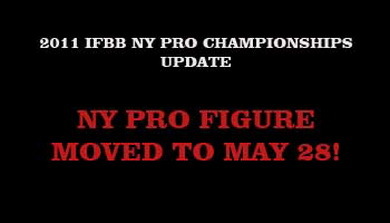 2011 NY Pro Figure Moved to May 28! The IFBB New York Pro Championships is arguably the most prestigious show of the year behind the Olympia and the Arnold. This year pro figure will join the action on May 28 at the Tribecca Performing Arts Center. The NY Pro Figure Championships was originally scheduled to be held in conjunction with the NPC Team Universe in July (as it had been in past years). Read more2011 NY Pro Figure Moved to May 28! The cause was respiratory failure resulting from pneumonia, his family said. And it was no wonder he lived so long, as LaLanne maintained the epitome of the clean life – as a child, he ate junkfood, but he always stated that he never ate unhealthy as an adult. Before such endeavors were popular, LaLanne was into bodybuilding and weight lifting in the 1930s in addition to being a chiropractor. He was a pioneer in the fitness world, much like Joe Weider, with whom he was close. He had a television program, “The Jack LaLanne Show,” which was viewed by millions of people. 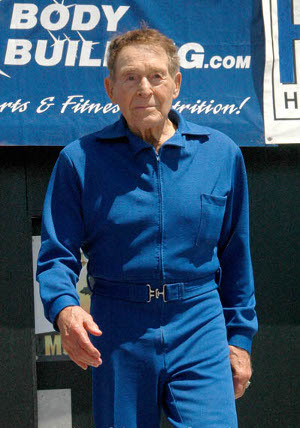 LaLanne owned health spas and created cutting edge exercise equipment in his 20s and 30s, and his authority on heath and fitness endured even into his 90s, as evidenced by countless TV appearances and the popular “Jack LaLanne Power Juicer” that he sold on infomercials in recent years. To say Jack LaLanne had staying power is a massive understatement. JOSE RAYMOND Enters the FLEX Pro Pound-4-Pound Challenge! IFBB Pro Derik Farnsworth stepped up to call out all of his critics and put up his own cash for anyone that can beat him in the squat and deadlift. As we should have guessed, all of Derik’s critics had more bark than bite and no one entered the challenge. No one until now! Read moreJOSE RAYMOND Enters the FLEX Pro Pound-4-Pound Challenge! How did you get started with bodybuilding? I played rugby in my teens and I wanted to gain weight to enhance my performance. At the time, I only weighed around 130lbs but through weight training, I was able to gain almost 50lbs by the time I had graduated from high school. We’re not exactly sure how something we reported three weeks ago is news again, but apparently it is today: Dennis Wolf will compete in the FLEX Pro on February 19th at the Santa Monica Civic Center. Despite an internet rumor to the contrary, we caught up with Wolf this morning for confirmation. Wolf will look to continue his success from the 2010 Olympia, where he re-established himself as an elite competitor by placing fifth. The Los Angeles Fit Expo kicks the season off next weekend. This is always a great expo and a way to get motivated and inspired for the year. Lonnie Teper is also hosting the first NPC Naturally competition, which will be held in conjunction with the Fit Expo. Bodybuilding.com will choose a new male and female spokesmodel at the event and the competition is fierce this year. We’ll be there all weekend, will you? When “Pro Bodybuilding Weekly” returns on January 24th for the start of another year of bodybuilding talk radio, keep an eye (and an ear) out for some big changes. For starters, long time co-host and “athletes rep” Bob Cicherillo will not be returning for PBW’s 7th season. A series of contractual changes in the life of Cicherillo have forced him to turn his attention to some new projects and some exciting new opportunities. Rest assured, Bob has big plans! — So, the big question: Who’s gonna fill Bob’s big Size 13 shoes in the broadcast booth? Well, as it turns out, those shoes are so big, the search for a new co-host led to NOT ONE, but TWO of the bodybuilding community’s most knowledgable and influential personalities, giving way to a new 3-man format. Joining Dan in PBW’s new “3 Man Booth” is long time IFBB Pro League official Lee Thompson. When it comes to “inside scoop” it’s hard to get any closer to the action. In addition to his annual seat at the Olympia judges table, Lee’s candid insight and understanding of all aspects of the sport is in a league of its own. 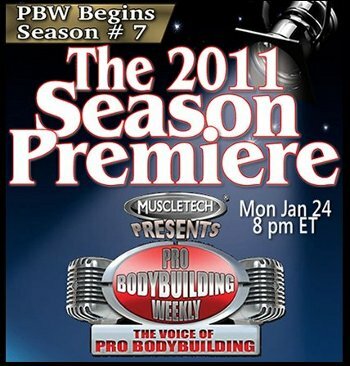 Lee’s addition to the show ensures that PBW will continue to deliver the latest IFBB/NPC news….straight from the source. Team BSN Welcomes IFBB Breakout Star Roelly Winklaar! BSN® is pleased to announce the latest addition to its elite roster of athletes, IFBB pro and 2010 New York Pro Champion Roelly Winklaar! 2010 saw Roelly emerge from relative anonymity to take the IFBB by storm in his rookie season, making a splash with a strong debut at the Arnold Classic before taking the top honors in New York and finishing the year with his first trip to the Olympia stage. Along the way, Roelly’s mix of size, conditioning and an undeniably freaky aesthetic made a lot of people around the sport take notice, and BSN® was no exception. With his immense promise and relentless dedication to improve and take his physique to even greater heights, Roelly will make an excellent ambassador for the world leader in nutritional supplementation for years to come. A native of Curacao who now resides in the Netherlands, Egberton Rulove “Roelly” Etienne-Winklaar first came to national prominence in the US with his overall win at the 2009 NPC Arnold Amateur Championships, displaying a rare combination of massive size and shredded conditioning that heralded big things to come. The dominant win set him up for his big 2010, highlighted by his top-three finish at the Australia Pro Grand Prix and stunning victory at the prestigious New York Pro. With a passion for competition and some valuable Mr. Olympia experience now under his belt, the future looks very bright for Roelly in 2011. 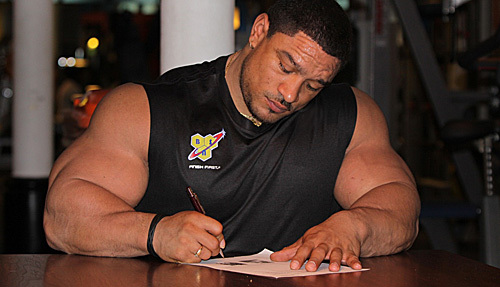 Read moreTeam BSN Welcomes IFBB Breakout Star Roelly Winklaar! Exemestane represent a steroidal aromatase inhibitor that comes in oral forms. This drug decrease production of estrogen in the human body attaching to the aromatase enzyme responsible for estrogen synthesization, and block it. The same as all aromatase inhibitors, Exemestane is used in medical major for treating breast cancer in women that are in their post-menopausal period. Between bodybuilders Exemestane is well known and often used because of its proprieties of blocking estrogen production. Excess of estrogen provoke such side effects as water retention, acne or gynocomastia, this substance will help to avoid them.